It seems like everything I've been doing lately, in regards to sewing and design, has to do with using small pieces of fabric that I've saved. As you probably know, if you've seen any of my posts, I'm fond of black, grey and white. So, most of my stash goes together! That's the good news. The bad news is that as much as I use these remnants, they just keep growing, it seems! I feel like it's Linus' blanket, I keep using smaller and smaller pieces! Not to digress but my sister used to sit outside under the clothes line on the day her blanket was washed. She would drag her little chair out there and wait for it to dry. The "it" got to be about 5" square before my mother "lost" it. Sibling similarity...I just can't give up on my scraps. 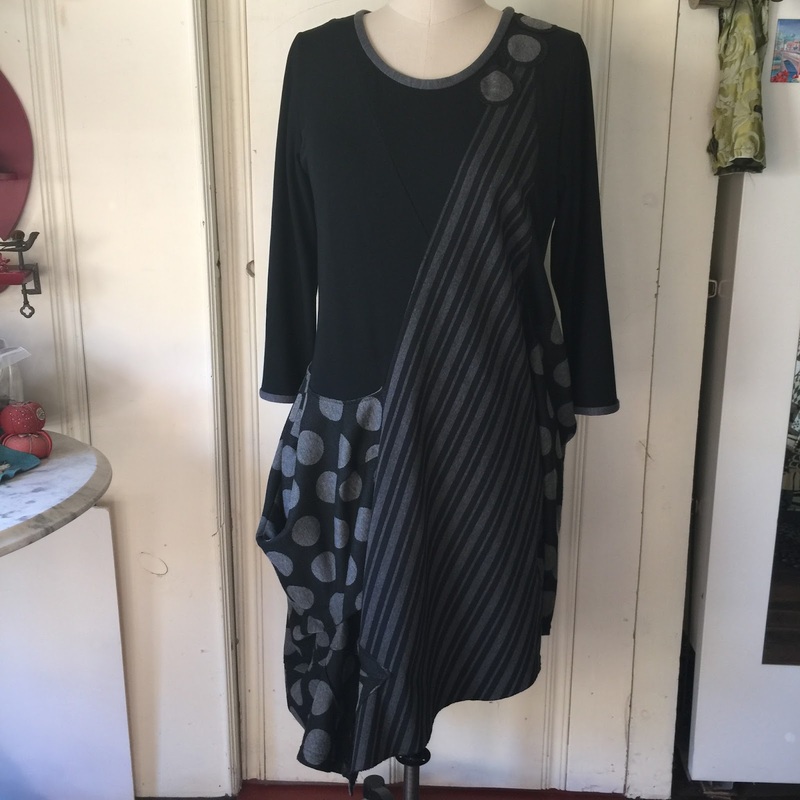 So, at this year's DOL in Santa Barbara I wanted to drape a dress using my TNT pattern for a knit top with various stretch woven fabrics and other knits draped on the bottom to make a dress. I brought my traveling dress form....she's quite a bit smaller than I but serves as a fluffed-out hanger of sorts. 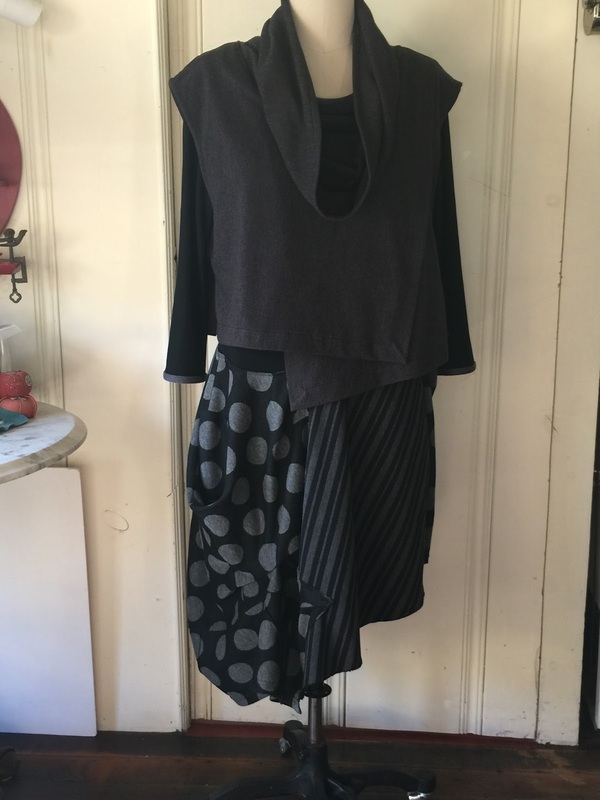 I cut the top out of a stable black knit and worked down from there. I regret not having taken any photos at the time so all I have is the finished piece. I had a lot of help from Diane Ericson, who dropped by every now and then, plus I pulled her in whenever she passed by. And plenty of help from Jenny Freedman, the class angel who worked with me really closely, invaluable! It feels really comfortable on and so I think I'll wear it a lot. I wore it with grey capri legging because it's high (above my knees) on one side. 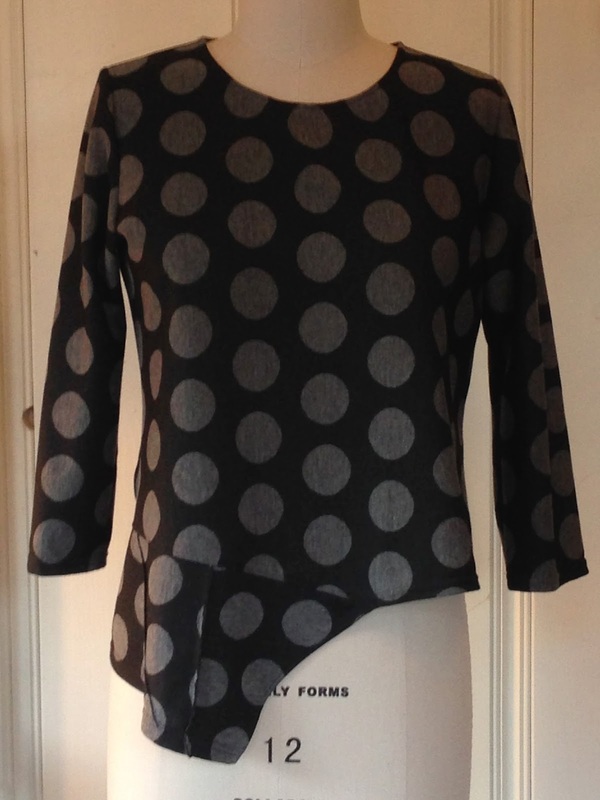 As you can see, there's a large dot fabric with huge pockets in the front and back. I used an already made top that I don't wear anymore because my sewing pal, Janet, told me not to. I did not argue. It went into the fabric pile. I cut the top in two pieces and the sleeves became the pockets. I'm lucky, I have skinny hips so I can bulk up in that area..I won't mention what I'm NOT lucky with...so the pockets help my profile...at least in my fantasy world. Here's the top I cut to make the pockets. 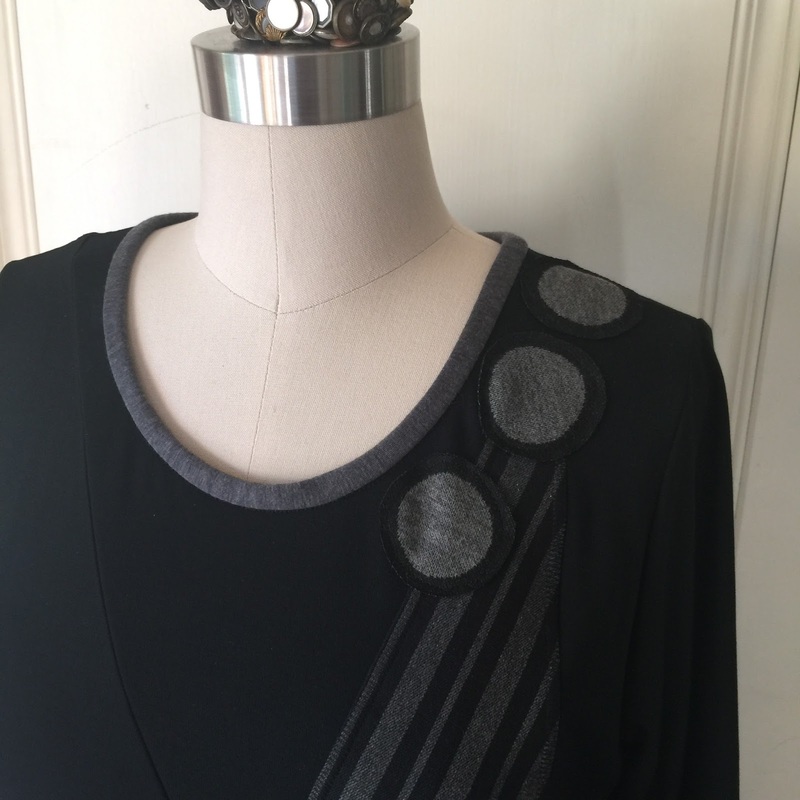 The neckband and the sleeve bands came together really fast. I wanted a little heft since the rest of the garment is pretty weighty. I cut a 3" band of lightweight knit, doubled it, sewed it to the right side of the neckline with 1/2" seam allowance and then turned it to the inside encasing the seam allowance. Then sewed it down, stitch in the ditch style. Sometimes you just get lucky. 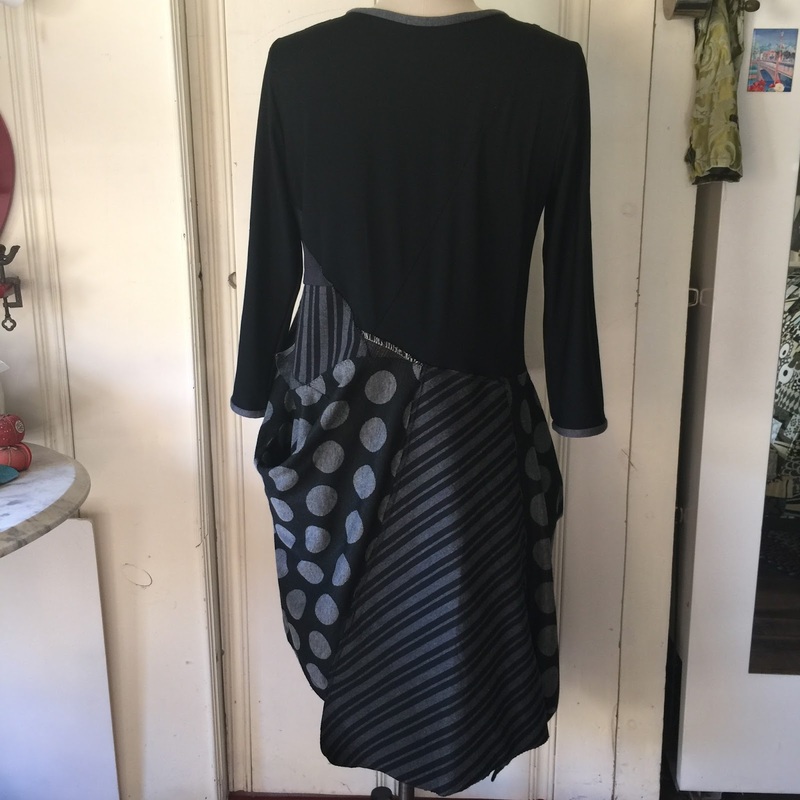 I wore it with the Cutting Line Designs vest pattern I'd made a few months ago. It looked better on my body than it does on the dress form tho. There was a bit of the black bodice peaking out at the bottom of the vest. I love this pattern, super easy, quick and adapts to so many fabrics. I've just finished it in a http://marcytilton.comMarcy Tilton crazy laser cut neoprene. As soon as I've figured out what to wear it with I'll show you. I've just finished a wonderful class with Gwen Spencer, who works with Marcy Tilton on bringing her designs to life for Vogue Patterns. She's a genius when it comes to "making fabric". Her approach is subtle but so dynamic and balanced. I'm still working on the top I made in the class. More on that in Making Cloth-Part Two. In the meantime, enjoy wisteria season!